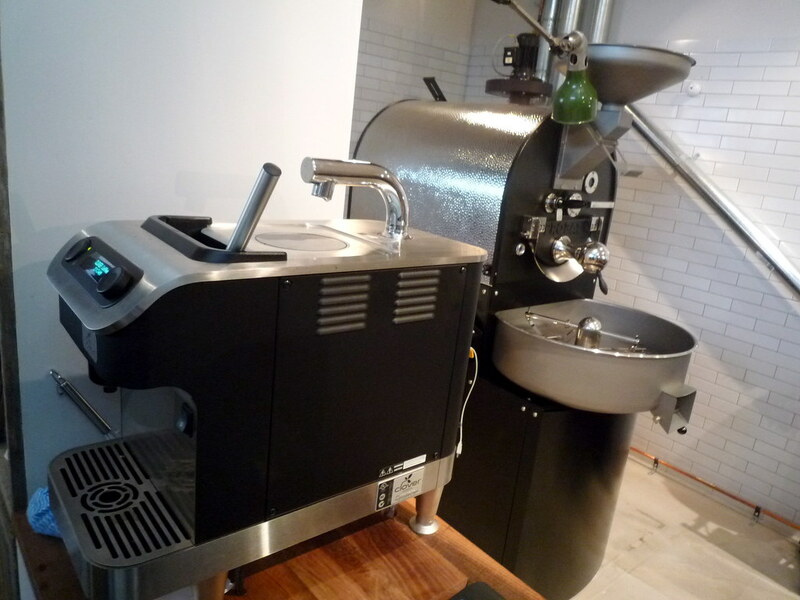 My, isn't Melbourne getting a lot of specialty coffee houses? Melbourne fans of the so-called third-wave coffee movement (first wave = post-WWII, second wave = Lavazza/Vittoria) really are spoiled for choice, with excellent specialty coffee available at Auction Rooms, Outpost, Brother Baba Budan, Seven Seeds, Crue, St Ali, Dukes, Liar Liar and Proud Mary (note: it's only been open less than three weeks, but I think I'm the only food blogger in Melbourne that HASN'T visited Proud Mary yet!). Well, you should definitely add Market Lane at the Prahran Market to that list. I went there this morning and loved it. 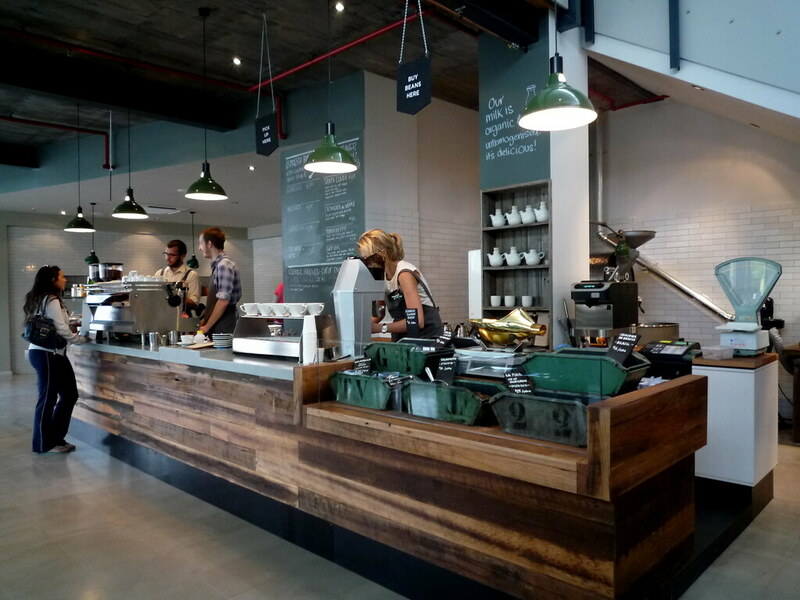 Open a week and a half ago, Market Lane is Fleur Studd's latest coffee venture. 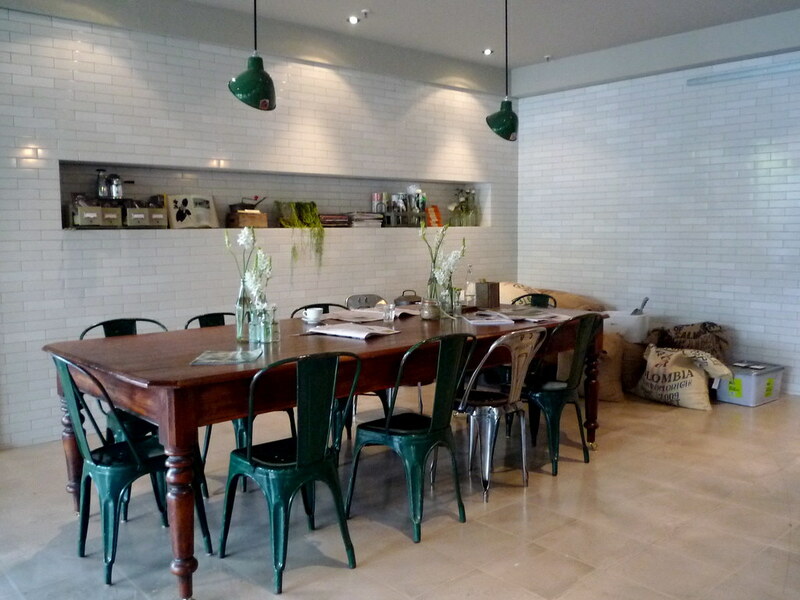 It's tucked in the back corner of the Prahran Market (with an entrance on Elizabeth Street), in the site that used to house an organic fruit and veg store. 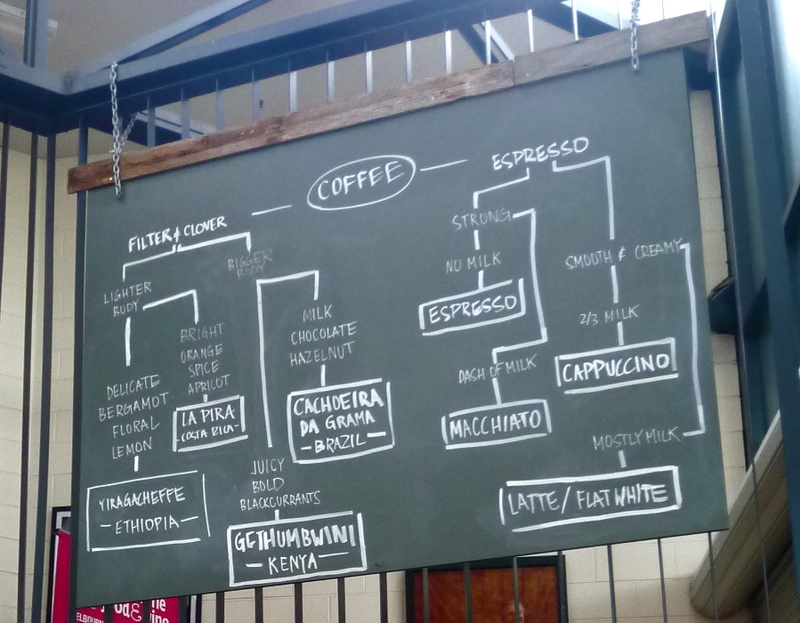 I just love this coffee flowchart they have up on the wall. What sort of coffee do you feel like? 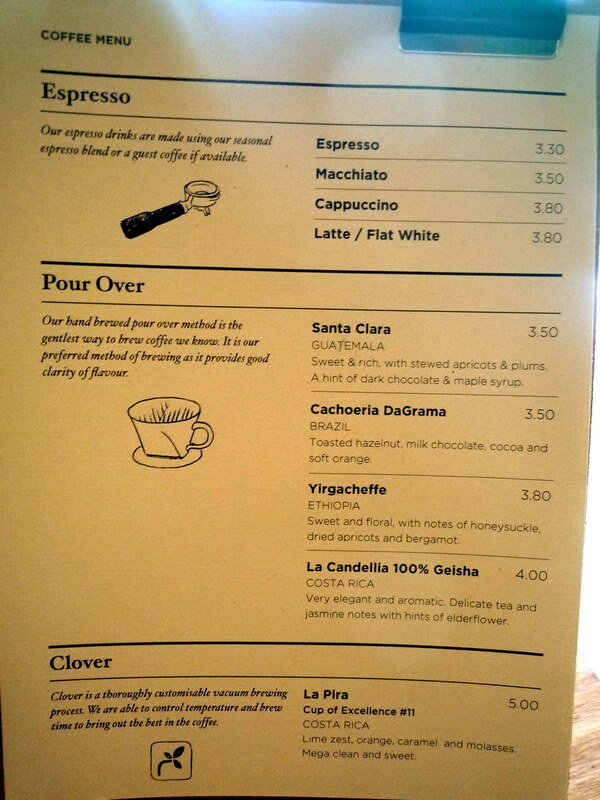 The coffee menu. Provides plenty of choice, but gives enough clear, helpful information for non-afficionados to work out what they want. My coffee companion was the delightful Jess of Sugadeaux cupcake fame (she brought me THE most wicked little salted caramel mini bundt, whoo hoo!). 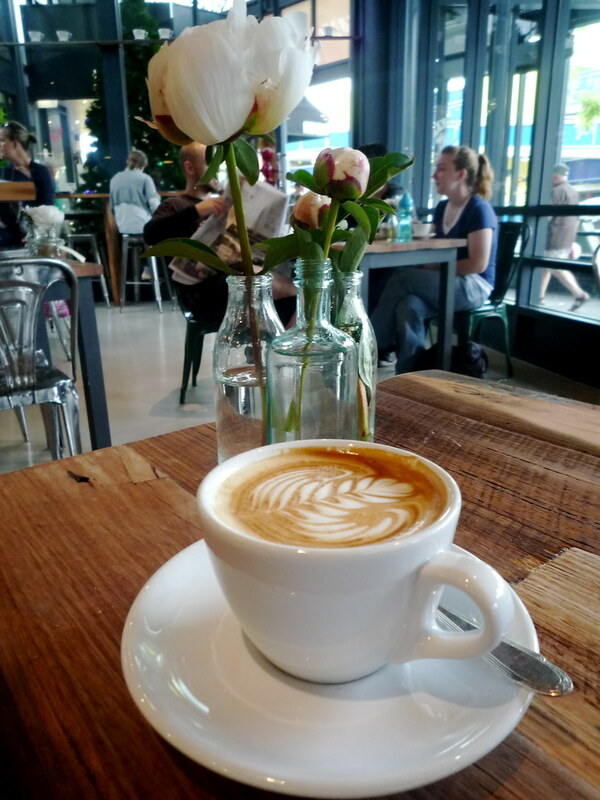 She ordered a flat white ($3.80). I ordered a Clover coffee ($5) from Jason and Trent, the charming SITSMs - rest assured it's a term of endearment, fellas :) - behind the bar. They kindly brought over an extra little espresso cup so that Jess could have a taste - pretty crockery, eh? The coffee was La Pira (Cup of Excellence #11) from Costa Rica. It was beautifully clean, and made me bounce around for the rest of the day. 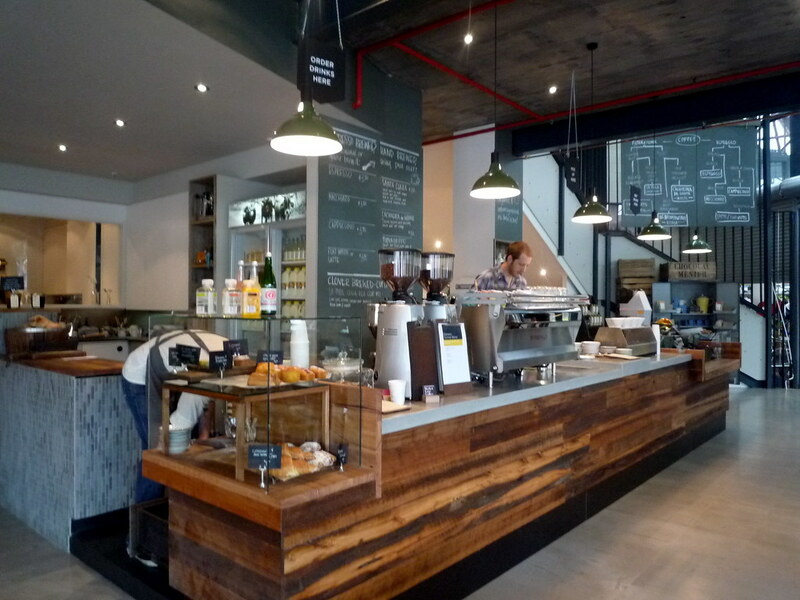 The main focus at Market Lane is on the coffee, but it also has a few croissants, pastries and sweets on offer. 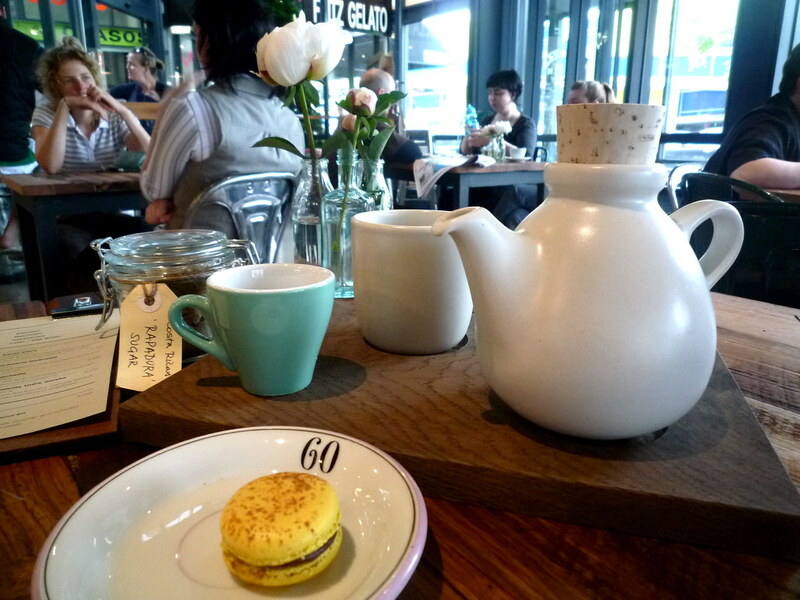 I couldn't resist also ordering a passionfruit and chocolate macaron ($3). It had a nice zing and was mercifully free of crunch, but a little on the small side. Gorgeous fit-out. To the right of this table is a little back room where a guy was setting up a cupping session. He invited us to join in, but alas my feeble caffeine tolerance wouldn't have allowed for it on top of the coffee I'd already consumed. 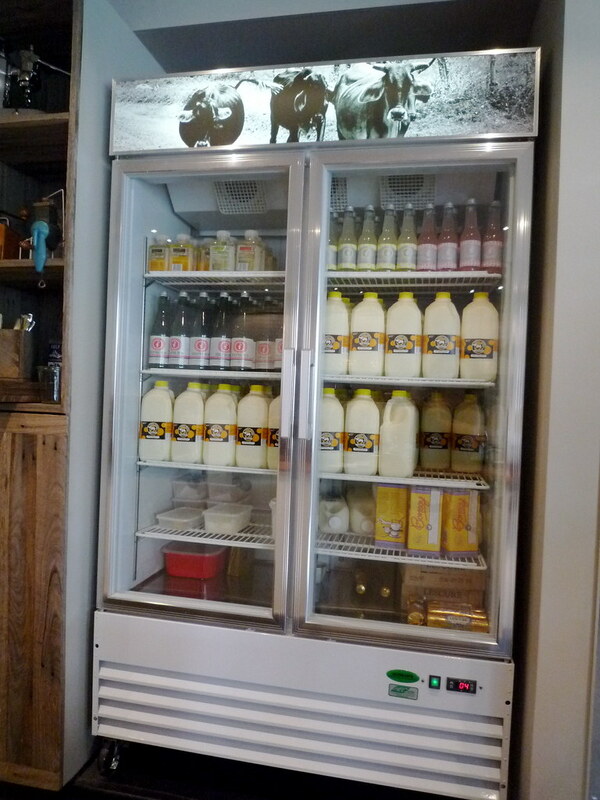 I liked the photos of the cows above the fridge where the organic, unhomogenised milk is stored. Trent invited me to come around the side so that he could talk me through how the Clover machine works. That's the roaster behind it: Jason roasts the coffee every Wednesday when the market is closed. 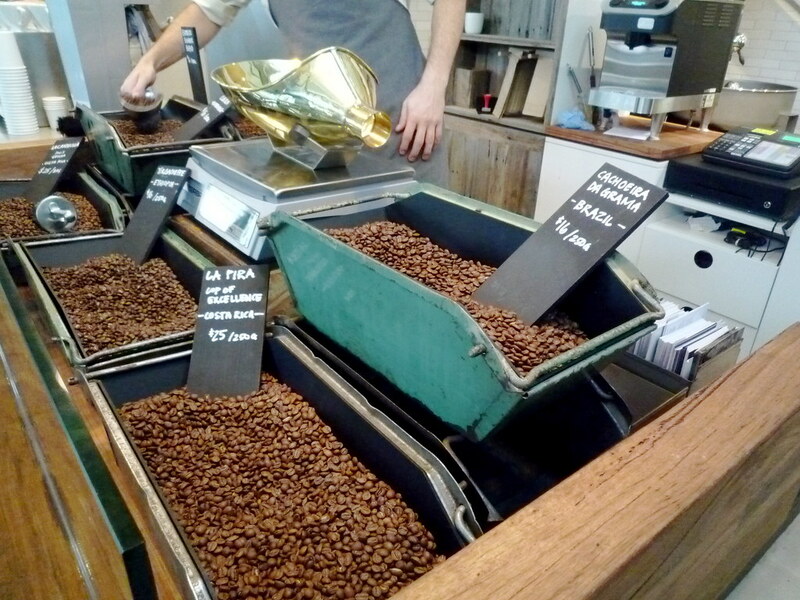 Oh, and of course you can buy coffee beans to take home too. Given that I do my market shopping most Saturday mornings at Prahran, I envisage I'll be visiting quite often! brilliant! one more place that I need to go to before we end our short stay around this area. 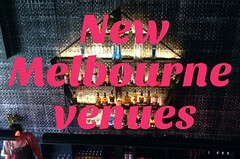 Can't wait to try this new exciting venue. I feel so spoilt to live in this area (also love "final step" and "lawson grove" in addition to all the one you mentioned). 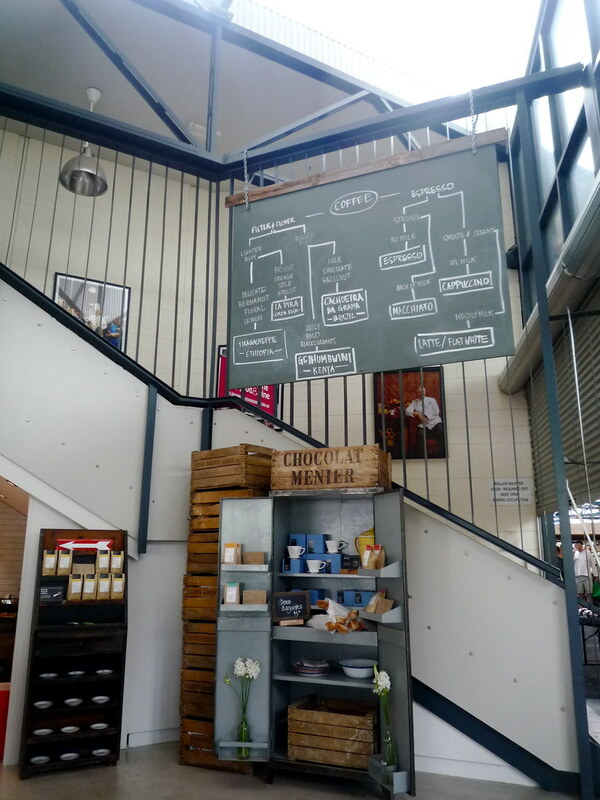 Love this coffe shop, absolutely awesome - and I am from Vienna (the home of grand coffee houses ;). 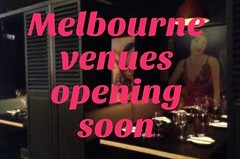 A must for anyone to visit Melbourne. Anyway, I am biased - I am a coffee addict! Thanks Vida and Penny. It's definitely worth a look - plus check out their website, it's now gone live. Glad you like it, momijitomitsukoshi-san! Ooh, thanks Alice, I haven't been to either place you mentioned. Will bear them in mind. Glad you like it, Anonymous. I'm heading back there again this morning! I'm a huge fan of Jasper Coffee, who also deal their caffeine at Prahran Market, and at a much more reasonable price than Market Lane. With such a lovely setting though Market Lane is sure to draw a following. I look forward to having a taste test! Hmm, I didn't think that unhomogenised milk was legal for human consumption? You're confusing unhomogenised milk with unpasteurised milk, Erin. Under Australian law, all milk must be pasteurised - but it does not have to be homogenised. All fresh milk in Australia must be pasteurised, a heat treatment that kills bacteria. Not all pasteurisation is the same, however, and various techniques meet health requirements. Just about all milk in Australia is homogenised. Forced at high pressure through fine pipes, the cream becomes evenly dispersed. Homogenised milk is whiter and has a thinner mouthfeel than unhomogenised milk.